Would there be issues with this arrangement? The piggybacked board is a Duex5. I'm particularly interested in if there'd be any signal problems with the ribbon cable folded between the boards. There's Kapton tape protecting the cable physically and I could easily shield it with copper foil if needed. Oh yeah... The bed mosfet on the main board will only be driving SSRs and the mosfets on the Duex5 aren't going to be used so no heat issues there. Edited 1 time(s). Last edit at 06/06/2018 06:06PM by gtj. Re: Would there be issues with this arrangement? That arrangement should be fine. You could shorten the ribbon cable if necessary. 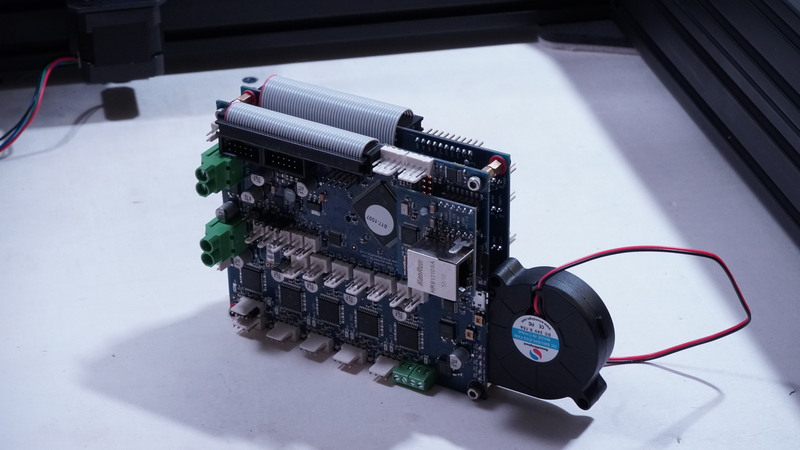 Fan cooling will probably only be needed if you run the stepper drivers above 2A current, or if something else nearby (e.g. PSU) generates heat. Edited 1 time(s). Last edit at 06/07/2018 11:51AM by dc42.